bottom of this page for charts. three days before it was written! that the true report had been written by a completely different doctor and filed on June 16, 2011.
between the product and the event. 1990s into the brand new center and is using the outdated machines on patients. available on a CD for $10? taken on June 15, 2011 was not saved on anything other than thermal paper. reports show an incorrect date for the procedure. Each report shows a different authorizing doctor. And the report was co-signed by Dr. K three days before it was written by Dr. G! Time travel? 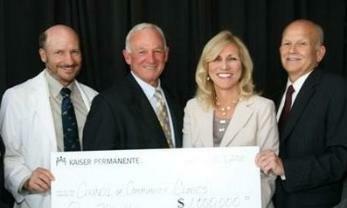 Can you spot Kaiser Permanente's false statement? medical reports in statement "b"? Statement "a" is true. All X-rays and imaging tests at Garfield Specialty Center are digital. 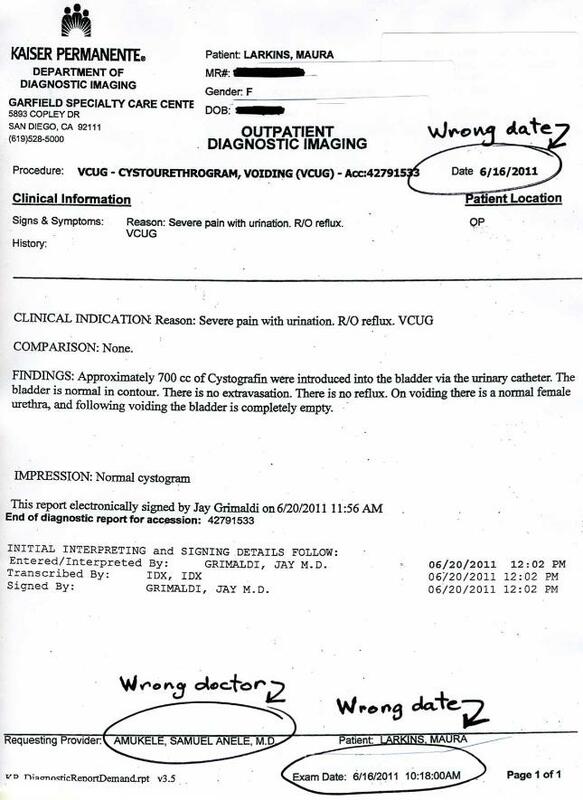 cystogram was not saved electronically and we can provide medical record on thermal paper." a) "All our X-rays and imaging tests are digital and become part of your electronic health record..."
missing X-rays, or that my reports had been tampered with. discuss the issue with me. I guess he just can't admit he was wrong. 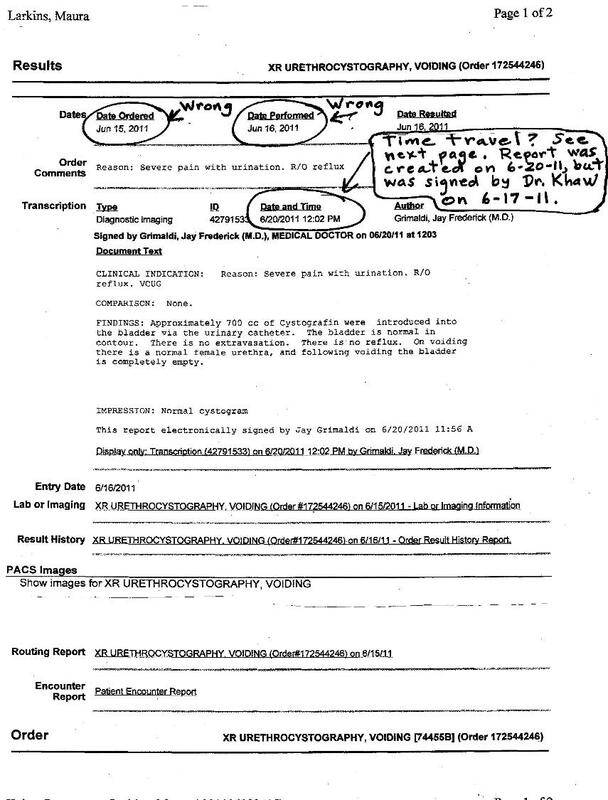 Here is the document with the false statement "b." 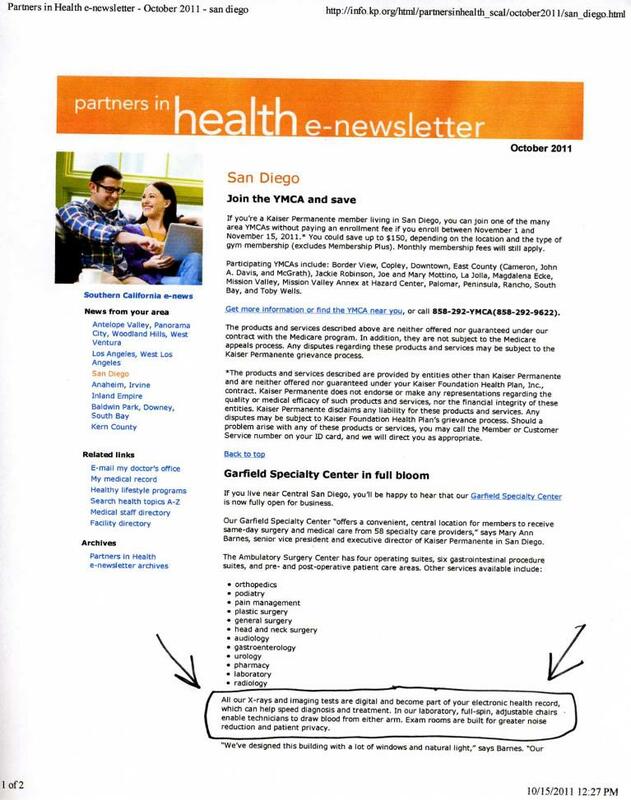 This document flatly contradicts the newsletter above.  we can provide medical record on thermal paper. the complete set of digitized images? Or was this report written by someone else? 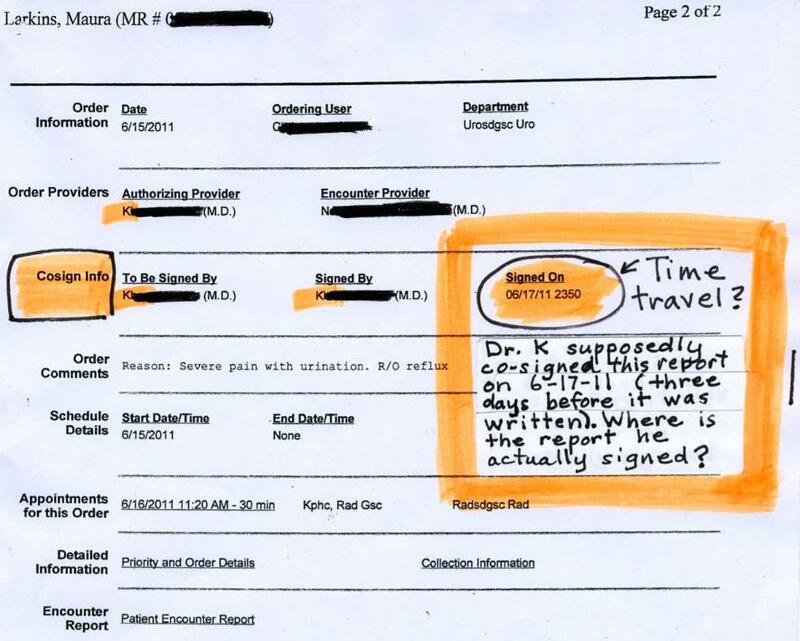 Update: It was written by someone else--Dr.
attached to a false report. testicle. For the next 6 months, the pain from surgery got progressively worse. 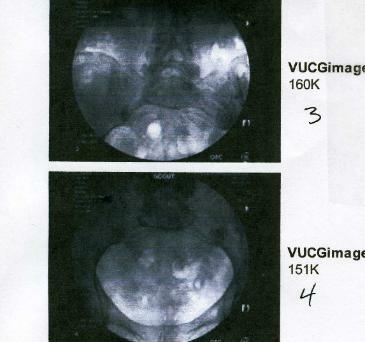 The urologist did not know why I was in so much pain. wouldn't feel the pain. Eleven months after that operation and the pain is back. I am no longer a Kaiser member, so they refuse to see me. I had none of this pain prior to their operations. 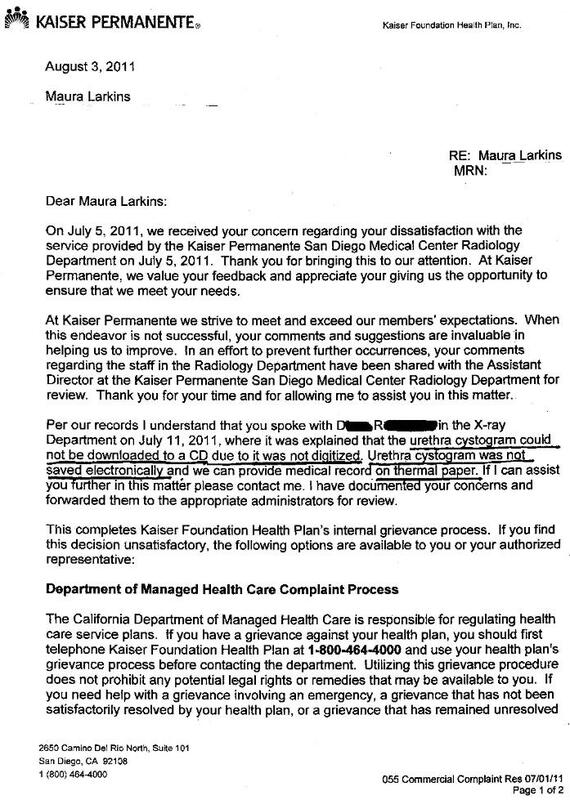 For over a year, Kaiser primary care physicians refused to order CT scans for multiple systems. They stated that, at my age, the tests are not given. I then went to an out of network physician, who ordered the scan, and advance Stage III cancer was discovered. allow the cancer to spread. I insisted on surgical removal of the cancerous right kidney and lymph node, which was eventually done. the universally recognized post-nephrectomy treatments. It consists of blood tests and CT scans. and the cancer has spread throughout the body, along with the pain that accompanies that condition. By that time, it will be too late. 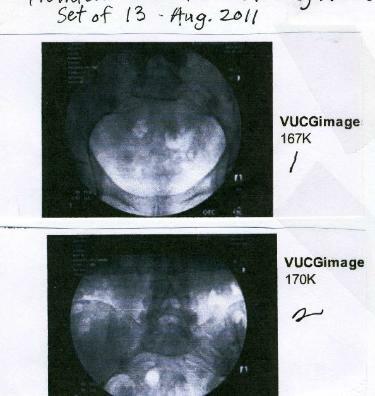 told by your plan urologist to do nothing and letting the cancer metastasize throughout your body, with the pain and early death to follow. into the incurable stage III plus condition. Then, when surgery was finally done, the standard tests and treatment are being denied. prefer the hospital with much worse survival rates! among best for difficult cases. for severity and other risks. The "reputation with specialists" seems to have become a measure of political, rather than medical, success. specialists as UCSD, and Kaiser, with a death rate double that of UCSD, has an equally good reputation! Lynette Seid's (CFO and Head of Medical Records) masterpiece. the review was canceled a week later.